Dealing With A Faulty Opener? Contact Us If Your Opener Isn't Behaving! Unfortunately, these systems are prone to suffer from the occasional malfunction or breakdown. We know how much of a hassle it can be when your door suddenly stops functioning because of an opener related problem – we have the best repair team in Georgia, just give them a call when this happens to you. Call us to inspect your unit if it is playing up or acting unreliably. Problems with this component are usually attributed to a worn motor or a problem with the safety sensors. Our experts we'll be able to troubleshoot the common issue and provide you with the best solution for the problem. If you're looking for a replacement, we'll endeavor to help you make the best choice when it comes to powering your door. The original automated opening mechanism, chain drives are renowned for being built-to-last and very reliable. However, for those who have bedrooms located near their garage, these types can also be a bit too noisy. However newer models do offer smoother operation and some noise reduction. Homeowners seeking a quieter, but cost-effective motor solution may wish to consider a screw-drive version. This type of unit is the perfect in-between solution. As it features fewer components than other mechanisms, these openers can also be easier to maintain. Belt-driven systems offer the best in terms of noise and smooth operation, however the belt will need to be replaced in the future and lubricated from time to time to keep it from squeaking and to extend its working life. Our company has a wealth of experience when it comes to the installation of new units. Regardless of the unit you go for, call us to do it for you. If you’re looking to free up space in the ceiling of your garage, perhaps to create extra storage room, you wish to consider having a jackshaft opener unit installed. These wall-mounted models lift the door through a cable and pulley system. Whatever your needs, you can rely on our unmatched expertise and experience to repair or help you choose your new system. 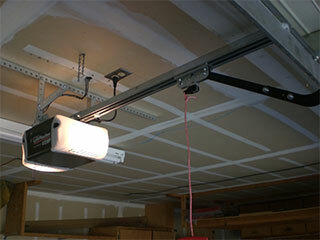 Just contact our experts at Garage Door Repair Powder Springs to discuss what we can do for you.